Fighter. Killer. Soldier. Tharshiny Ramasamy didn’t seek any of those titles. But now she was trapped in the center of a bloody, decades-old civil war. How would she survive? Ethnic conflict in Sri Lanka, the island nation once known as Ceylon until independence from Great Britain in 1948, had long been simmering. Tensions exploded into civil war in 1983 when the Tamil Tigers, a rebel group representing the oft-suppressed Tamil minority, sought independence. The northern city of Kilinochchi— where young Tharshiny lived—was to be their capital. Aerial bombardments, gunfire and mortar rounds shattered windows and nerves. Menacing-looking soldiers roamed everywhere; the smell of death hung in the air. Such ever-present threats haunted little Tharshiny. Some days were spent in bomb shelters. Any day, she feared, might be her last. By the time Tharshiny reached the age of 8, wartime hardships had sunk Tharshiny’s parents even deeper into poverty, forcing them to ask another family to care for their daughter. Tharshiny was fed, clothed and sent to school by her foster parents, but never loved—their biological children always received preference. Tharshiny wasn’t even allowed to visit her own parents. As she entered her teens, another fear hijacked Tharshiny’s mind: the threat of “carders” (rebel recruiters) forcefully conscripting her. As the war dragged on, the need for fresh soldiers increased, but the requirements for service decreased. Tharshiny knew of others who’d been forced into combat, so she feared to go anywhere alone. Tharshiny’s luck ran out on January 19, 2009, when several carders showed up at her home and abducted her. She was 19 years old. Tharshiny underwent mandatory rigorous training for several weeks, which included learning how to handle different types of guns. Her fear of death, which had cast a shadow before every step of her life, now threatened to choke her. She wept many lonely nights and longed for deliverance from the hell that seemed to be consuming her. The Tamil Tigers were on the ropes in the spring of 2009—the fighting intensified as they took their last stand, and Tharshiny was sent to the front. I will die here, she thought. Instead, she was captured alive by Sri Lankan forces—but now she feared she would be raped and then killed. She was interrogated, rather, and sent to a rehabilitation camp for other unwilling combatants like her. Once again her greatest fears did not come to pass. Raised a Hindu, Tharshiny began to wonder if some deity was watching over her. By early May—26 years after the war began—the Tamil Tigers surrendered. Many estimates place the death toll at well over 100,000. Those who were wounded, fell victim to atrocities, or suffered the destruction of property may never be numbered. The girls and staff of Jaffna Children’s Home, where Tharshiny now serves. Most are war orphans. Three months later a court ordered Tharshiny to House of Hope, a care facility for children. There she met Pastor George Niranjan, a Heaven’s Family partner. He and his staff showered Tharshiny with love, watering the desert of her heart. He encouraged her to resume her studies, but because of her age she wasn’t allowed to return to public school. 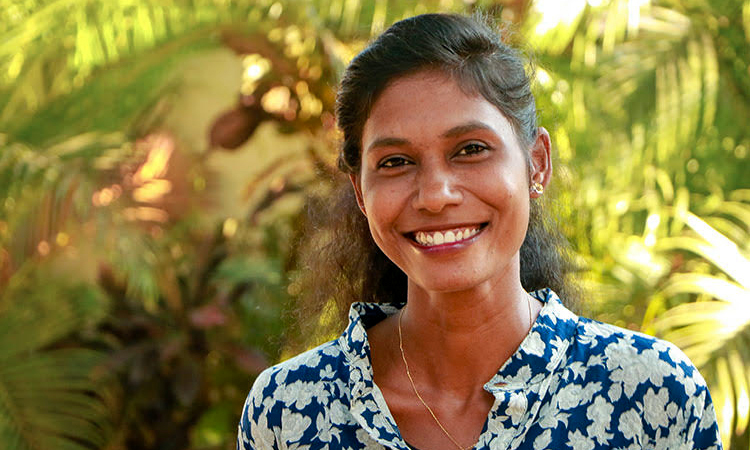 With the help of Heaven’s Family’s Education Ministry, Pastor George organized vocational training for Tharshiny and other girls who missed schooling during the war. The computer course interested her the most, and she poured herself into her studies. Pastor George also introduced Tharshiny to Jesus Christ, and reunited her with her parents. She now works with Pastor George to care for orphans and other children scarred by the war, showing them the Love she’s found. Tharshiny is especially thrilled that she can now help her parents financially. Connecting the dots of her life, Tharshiny realized that Jesus had been protecting her throughout her fear-filled childhood years. She’s enormously grateful for her new life, and now serves Him with all her heart. Fear and Death have been replaced by Love and Hope. Once an unwilling conscript in a bloody war, Tharshiny now joyfully serves another Commander as a “soldier girl” for Christ. Tharshiny’s life has changed dramatically since meeting Pastor George and being introduced to Jesus. 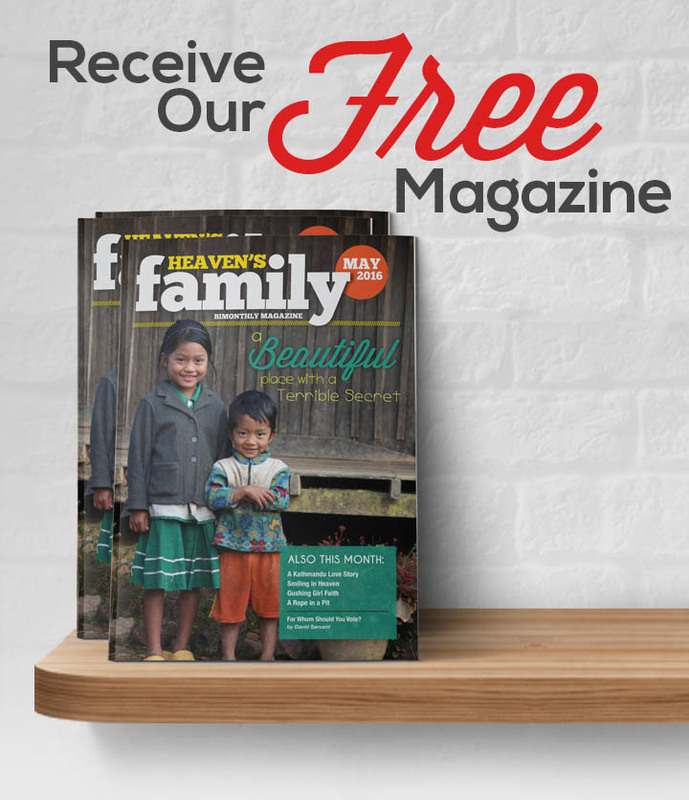 And we’re thrilled to know that Heaven’s Family had a part in changing that one life. But there are many more lives being transformed! The Education Ministry not only provides poor children with a poverty-busting education, but it also leads them into a knowledge of our Lord Jesus Christ. We love advancing Jesus’ kingdom in Sri Lanka and around the world.